Harmoney are a non-profit social enterprise who provide clear financial help to those with money problems. CuCo were approached by Harmoney earlier this year during their search for an agency to develop a brand identity, strapline and mission statement for their business. Our creative team took the time to truly understand Harmoney as a business, and learn their brand values and beliefs. Harmoney is underpinned by the core values of integrity, positivity and balance. They offer practical financial advice and guidance tailored to the unique needs of each individual client. Harmoney are passionate. They are hopeful and future-positive and are inspired to help people manage their money in a balanced way. They are responsive. They react quickly and positively, they are always open-minded, always listening, and always learning. And they are straightforward. They are conscientious and fair, they strive for simplicity and clarity, and to make things as easy as possible. With this in mind, we started to look at ways in which we could incorporate these values into a brand identity logo, strapline and mission statement for the business. 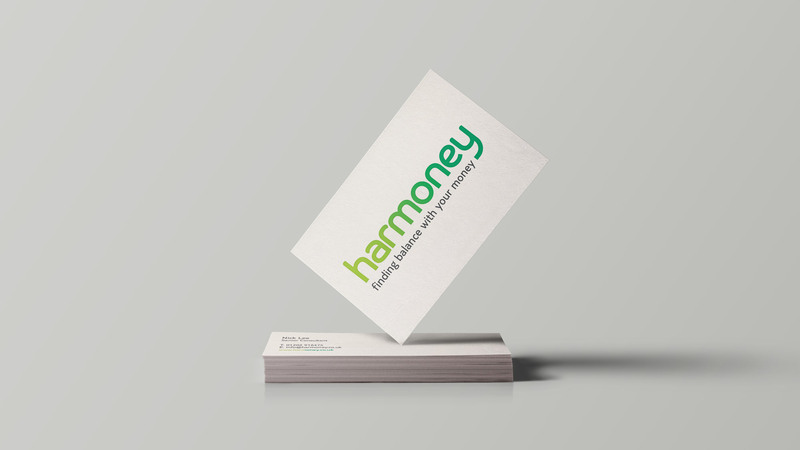 As we began to design the brand logo, we first of all explored ideas which could represent the concept of ‘balance.’, designing concepts full of movement – highlighting that Harmoney is a service that is always proactive. The creative team looked into various approaches, such as incorporating curved illustrations around the word ‘Harmoney’ to create a ying/yang sense of stability. The creative journey saw the final brand identity logo design use a bespoke simple, sans serif typeface to communicate the straightforward support and guidance offered by Harmoney when people need it most. We decided on a green colour palette to signify growth, trust, positivity, health and stability. The green gradient deliberately transitions from lime to a lush forest green. This heavy transition of the gradient between the letters ‘r’ and ‘m’ draw the eye to the word ‘money,’ to ensure this part of the company name stands out. An extended tail on the ‘y’ highlights the journey clients will go on with the company, the fact that the company go the extra mile for all clients and the fact that the end result of using Harmoney is a sense of clarity and long-term happiness and stability. The strapline ‘finding balance with your money’ has been positioned strategically within the logo – located between the left of the ‘h’ and right of the ‘e’. 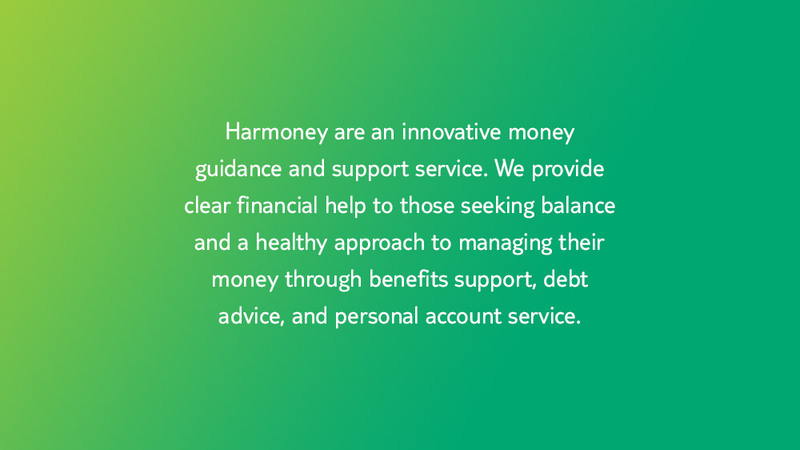 It focuses on the idea that Harmoney (harmony) is achieved through a state of balance, but the word ‘balance’ is also associated with ones savings/financial repository. This strapline is calming and clearly highlights that not only will Harmoney’s service bring financial stability to people’s daily lives, but also implies that Harmoney will help the client to find sources of capital. The final process in branding Harmoney was to introduce a mission statement. This was delivered ensuring it gives a clear understanding of what Harmoney offer their clients, whilst also demonstrating their knowledge and understanding of the current UK financial climate. It represents Harmoney as a passionate, trustworthy and knowledgeable service, providing existing and potential clients with the confidence that Harmoney can provide them with a truly personalised, customer-centric service that will guide them down the right financial path for life. If you’re looking for an agency to develop your brand or simply just a brand re-fresh, give CuCo a call today on 01202 911959 or drop us a line at hello@cucocreative.co.uk. We’d love to hear from you and discuss how we can help! Previous Post: Stuck paying your web design agency’s hourly rates every time you want to change something on your own website? Not CuCo’s clients!